Restoration from Hansin Earthquake Disaster / SUPPORTER'S NETWORK for community divelopment "Machizukuri"
Since the earthquake, we, SUPPORTER'S NETWORK for Community Development "Machizukuri", have been running the news letter "KINMOKUSEI". That covers reports presented by professionals as town planners, architects and researchers who joined our supoort network, as well as information provided by the network office.These articles have been a careful description on how the areas affected have been striving to recover from the immense damege of the earthquake. 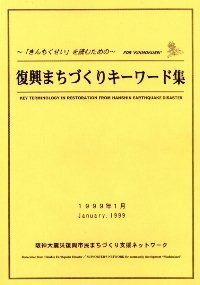 Wishing to be any response to the supports from the overseas, we came to issue "Key Terminology in Restoration from Hanshihn Earthquake Disaster" in January 1999. This homepage is the WWW version. What is Community Development Machizukuri for Restoration? Support for rebuilding in White Zones. 1. "Hisai Shigaichi Tokubetsu Sochi-ho (Special Act for Disaster Afflicted Urban Area)"
"Hisai Shigaichi Tokubetsu Sochi-ho (Special act for disaster afflicted urban area)"
1) "Too much demolition at public expense"
2) "Wood frame houses cannot be replaced"
3)"Temporary houses and public substitute houses account for one quarter." 4)"The problem of house and land rights and qualifications for loans"
3) Reconstruction of urban space north of Nagata station --- the creation of a residential environment, a district where people live safely and comfortably. 29)Rokkomichi station south district�@Yuko Arimitsu, Environmental Development Research Inc. Restoration from the Hanshin Earthquake Disaster/ Supporter's Network for community development "Machizukuri"
�@�@The Machizukuri planners, architects, and professionals in universities, who had worked in Kobe before earthquake and were willing to work for restoration for ourselves, gathered and started this network 10 days after the disaster. �@1)To hold the meetings to exchange the information of the recovery conditions in 4 areas (Kobe West, Urban Center of Kobe, Kobe East, Nishinomiya). �@2)To publish newsletter of "Kinmokusei"
�@3)To publish "Community Development Machizukuri for Restoration" every 3 months, which is the record of Machidukuri with newsletters and information papers distributed by community organization and public sectors. �@�@We also work on other activities, such as the survey of the damage and reconstruction condition, projects to plant the flours in the vacant sites, and to support the collective housing projects. Mail toSupporters Network for Community Development "Machizukuri"
A total of people have accessed this page (00.12.10�`).